French studio Nouvelle AOM has been selected to overhaul the Tour Montparnasse skyscraper, in time for the Paris 2024 Olympic Games. Nouvelle AOM is a team made up of the heads of three Paris-based firms: Franklin Azzi of Franklin Azzi Architecture, Fréderic Chartier and Pascale Dalix from Chartier Dalix, and Mathurin Hardel and Cyrille Le Bihan of Hardel + Le Bihan Architectes. The consortium won an international competition to oversee the €300 million (£266 million) renovation, which will see Tour Montparnasse – arguably Paris' most contentious building – given a "green makeover". "When we took up the challenge of this exciting competition, our focus was on revealing the beauty of the Tour Montparnasse from the inside out," said the team. "We achieved this by incorporating radically new uses and crafting a complete sustainable 'green' makeover of the facade. The aim is to make the tower an icon of the 21st-century energy revolution." 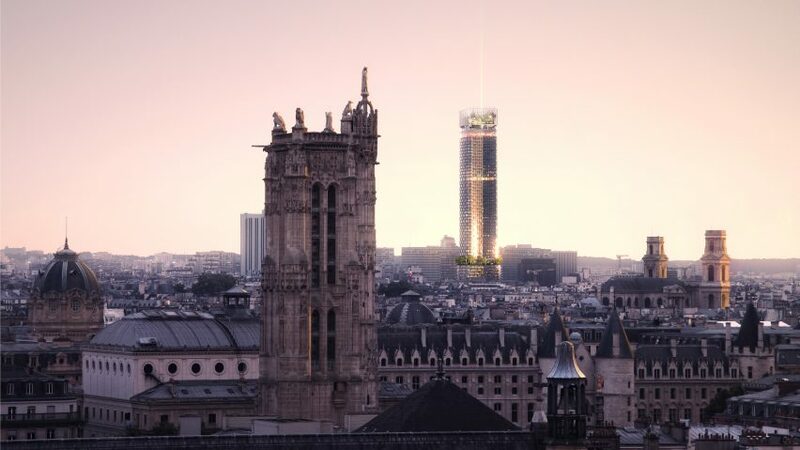 Nouvelle AOM defeated proposals by OMA and MAD and Studio Gang with its scheme, which will see the lower levels of the 209-metre tower covered in planting and crowned by a conservatory. Detached slightly from the main body of of the tower the roof-top garden is designed to visually break the height of the tower up. The competition was launched in 2016, following years of calls to revamp the city's second-tallest building. When the Tour Montparnasse completed in 1973, its design and height were met with such opposition that it sparked a 42-year skyscraper ban in the city, which has only just been lifted. "The redesign emphasises the horizontal plane, putting an end to the tower's vertical focus that left it isolated," said the architects. "The revamp also makes a shift from opacity to transparency, while compelling new uses will transform the tower into a lively thriving place, giving it back to the people of Paris." Tour Montparnasse was originally designed by architects Eugène Beaudouin, Urbain Cassan and Louis Hoym de Marien, and is second tallest only to the 324-metre Eiffel Tower. Uproar regarding its scale led planners to introduce a seven-storey limit on new buildings. In recent years the law has been updated to permit the construction of residential towers measuring up to 50 metres and office blocks up to 180 metres within the city's arrondissements. In 2015, Herzog & de Meuron won planning permission for its 180-metre-high Tour Triangle and Hamonic + Masson & Associés and Comte Vollenweider Architectes completed a 50-metre-tall housing development in a spate of new developments that followed the lifting of the limits. Earlier this year seven new skyscrapers by architects including Jean Nouvel and Norman Foster for the city's La Défense district, in an attempt to woo businesses away from post-Brexit London. Work is expected to begin in 2019 and complete by 2024, in time for the Paris 2024 Olympic Games.